A scene: we are gathered together, young and old…kids from age 3 to eighth grade, parents in their forties, friends in their twenties. 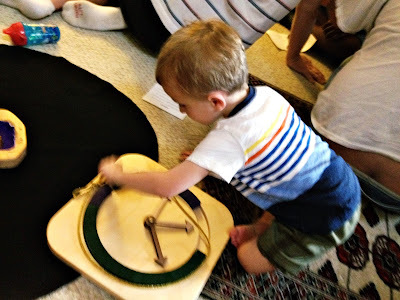 We make a circle and in the center a story is told with the use of props…some felt, wooden cutouts, a candle, copper wire twisted in the shape of a tree and some stained glass panels. It’s a familiar Bible story…when God speaks to Moses at the burning bush. The story goes that Moses’ name means “drawn out” but here in the desert God draws Moses in. So, Moses comes closer to God, attracted by mystery. But Moses cannot come too close. We made some interesting observations. Meanwhile, the three-year old played quietly, contentedly in the lap of his sixth-grade friend. He pointed to the little child, playing. We knew his answer was perfect. PlayFull exists to help people and organizations play from the inside-out. We offer training in a unique kind of children’s ministry that integrates the formation of young and old. Write Troy Cady for more information. Like PlayFull on Facebook or follow us on Twitter. Thank you for reading! Play from the inside-out. We invite you to like us on Facebook or follow us on Twitter. Thank you for reading. *This quote appeared in Plough’s Daily Dig on August 14, 2015.